Hansen and Batuman will be discussing their experiences reporting in Turkey and addressing the task, for journalists and academics, of examining the nature of American power in the Near East and beyond. 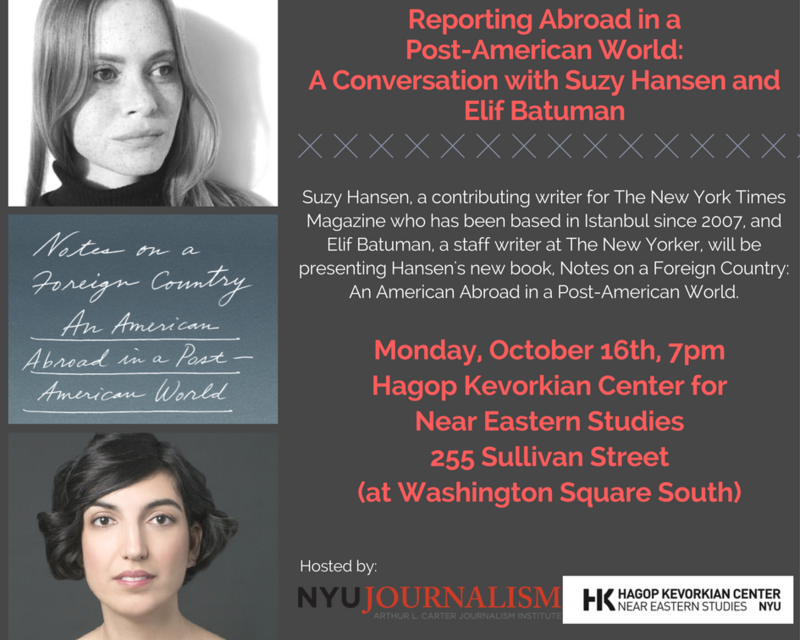 Suzy Hansen, a contributing writer for The New York Times Magazine who has been based in Istanbul since 2007, and Elif Batuman, a staff writer at The New Yorker, will be presenting Hansen’s new book, Notes on a Foreign Country: An American Abroad in a Post-American World. Writing in The New York Times Book Review, Hisham Matar called Notes on a Foreign Country “a political and personal memoir that negotiates that vertiginous distance that exists between what America is and what it thinks of itself.” Hansen and Batuman will be discussing their experiences reporting in Turkey and addressing the task, for journalists and academics, of examining the nature of American power in the Near East and beyond.